This site is dedicated to the stamps & postal history of British Empire "War Tax" stamp issues. "War Tax" stamps were issued by various entities within the British Empire (see list below) during World War I (and in the case of North Borneo, during World War II) to help fund the war effort. Generally these stamps were regular stamp issues that were overprinted with the words "WAR", "WAR TAX" or "WAR STAMP". The War Tax Acts in most colonies and countries stated that the War Tax stamps were to be used in addition to whatever postage & registration fees were due on the item being mailed (postcards, letters & parcels in some cases). While the stamps were supposed to be used just to pay for the War Tax, many times they were also used to pay part of the postage and registration fees (as long as the total amount with the war tax was correct, it appears that most countries did not seem to mind). 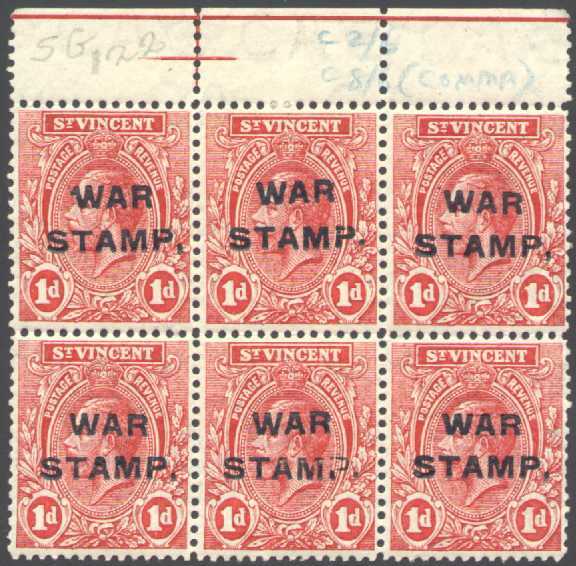 Finding mint (unused) War Tax stamps is easy, collectors and dealers bought them in large quantities. Finding War Tax stamps used on cover is a bit more difficult. While on-cover examples from places like Canada and many of the Caribbean islands is easy, finding them on-cover from Bermuda, Fiji, Gibraltar, Gilbert & Ellice Islands and the Gold Coast is extremely difficult. If you want to read more about War Tax stamps and their usages, you may want to consider ordering my electronic book on CD (see link above left or click here: War Tax CD). St. Vincent War Tax stamps on a St. Vincent picture postcard mailed to Seto, France, postmarked in Kingstown on July 8, 1917. A nice item that is difficult to find. 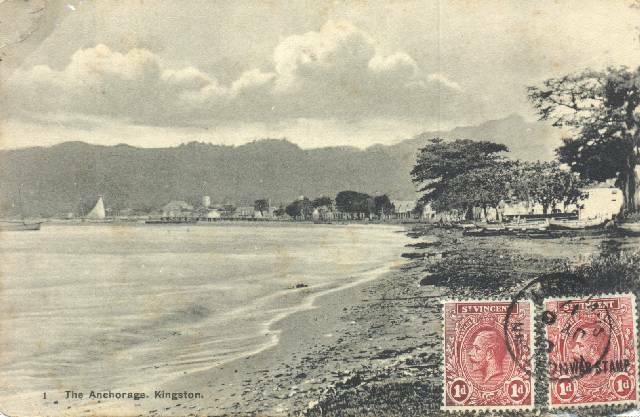 Note: Kingstown is misspelled as "Kingston" (since it was occasionally confused with Kingston, Jamaica by some people).